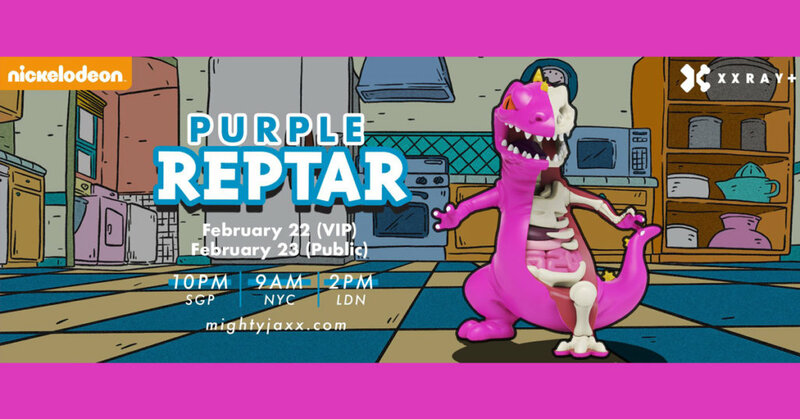 Last year we got to see XXRAY REPTAR FYE EXCLUSIVE and now XXRAY+ Reptar has turned Purple! Eaten too many plums? Anyway, Jason Freeny needs no introductions right, ha? But what does need an introduction is his take on the MIGHTY REPTAR from the 90’s TV show Rugrats (millennials you might have to youtube it, its worth it) Don’t worry kids, no blood involved. Thank you XXRAY for taking us down memory lane… Cue the Rugrats theme song, please. From Nickelodeon and Nick 90’s comes Reptar in a way you’ve never seen before! Jason’s early success as an artist came with his creations of a series of fictional anatomical character schematics and illustrations in 2007 but was most noted when he began creating anatomical toy sculptures shortly after. His sculptural and illustration work has been the basis for several mass-produced toys.